Posted on June 5, 2014	by Derek "Gamer Crash"
Bastion is a game that really snuck up on me. In fact, prior to reading a review about the game, I really had no clue what it was. As it turns out, Bastion remains one of my favorite games I’ve played on the Xbox 360. Funny how things work out that way, isn’t it? It’s beautiful, compelling, fun, and the music is pretty great as well. It’s because of Bastion that my expectations for Supergiant Game’s next title, Transistor, have been extremely high. From what I could see, Transistor had many of the elements that made me fall in love with Bastion including a beautiful art style, interesting gameplay, and another powerful soundtrack. It had all the makings of being something special but as we know, it can be difficult to capture that same magic twice. After what felt like a long wait, Transistor is finally out in the wild on PS4 and PC but is it another homerun for the gang at Supergiant? Full impressions after the jump. As Transistor opens, you’re introduced to a woman named Red, one of the best singers in the city of Cloudbank. Unfortunately for her, she wakes up to discover that her voice is completely gone. She’s unable to remember what happened but comes across this talking sword (narrated by the great Logan Cunningham) called the Transistor as they go on the run from the Camarata faction and a digital force known as The Process. The Camarata are in some way responsible for the events that put you at odds with The Process and caused your voice loss, so a major element is figuring out just what happened to you. So far, I’ve found the story interesting though I’m not sure I’ve really hit on the meat of it yet. There seems to be a more sinister aspect bubbling under the surface mixed with a ton of conspiracy and actions motivated by revenge for good measure. So far I like it, but for me, it’s not the defining aspect of the game. 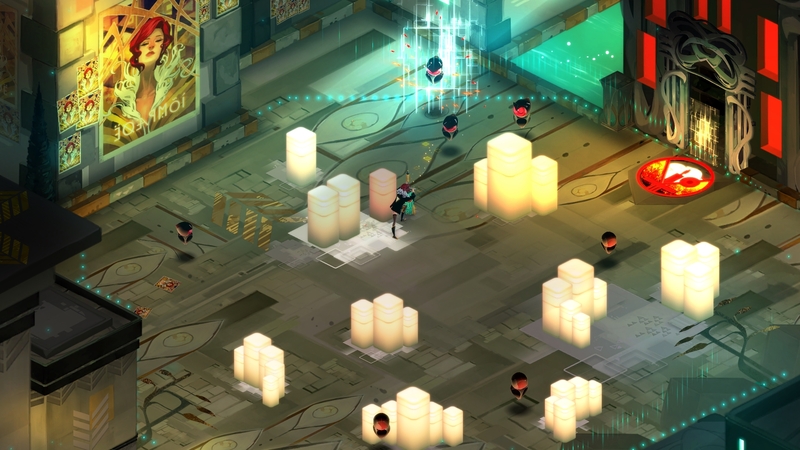 The game’s combat is where Transistor shines brightly. What I find most interesting about the combat is that it gives the player total freedom to tackle each situation how you see fit. For those that liked the real time action in Bastion, you can certainly do that here as well and it works extremely well. The interesting twist to combat comes from the ability to pause combat completely and plan out your next moves. An action bar drains when certain abilities are used so technically you can plan out maybe 4 or 5 moves at which point, you hit a button to kick the game back on. Now, Red will carry out the commands you just issued in a flurry of awesome quick strikes. This system makes every enemy encounter fresh and exciting as it gives you so many tools to play with. New abilities are gained through both story progression and the leveling system in place. These skill functions can be used in 3 different ways again revealing a much deeper system than was present in Bastion. Skills can be active (you can only have four at a time), passive (only two maximum) or can be used to augment one of the four active skills. Interestingly, each ability then changes properties based on how it’s used. So an active skill may be a simple attack, but augmenting a skill may give it a boost in effectiveness, or using it as a passive skill may give Red a bonus. In an interesting twist, each skill in this game represents the essence of a person who has left their body and is with the Transistor now. Kind of a weird digital afterlife perhaps? Either way, what’s cool about this is that the more you use the ability, the more of this person’s back story is unlocked. Sure, it’s purely fluff material and won’t affect the game in any significant way, but it’s just another nice tough to the stunning world that Supergiant has created here. 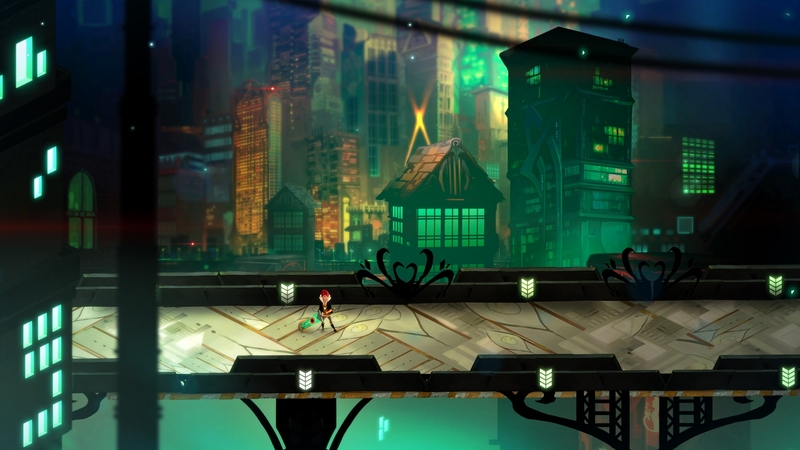 That stunning world is probably the only place I can currently find fault with Transistor. You can tell the city was crafted with a lot of care but the unfortunate thing is that we never really get a great look at it. Seriously, it’s a beautiful world and I want to know more about it. So far, the city of Cloudbank seems to have taken a backseat to Red’s story. Sadly, I don’t think that’s going to happen. Hopefully we see more of Cloudbank in DLC or future games because it’s a place I want to know more about. As you’d expect if you’re a Bastion player, visually, the game is stunning. 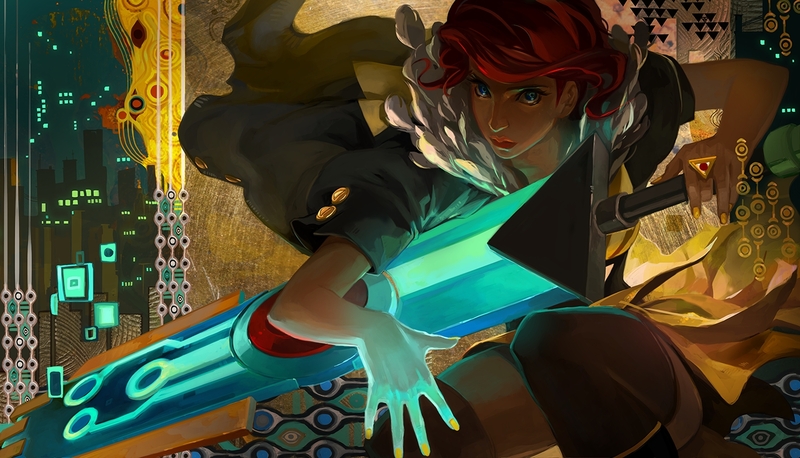 Featuring a rich and vibrant color palette, Transistor is a feast for the eyes. Everything is hand drawn as expected and characters almost have this sort of anime style quality to them. The setting is just as interesting to look with a heavy futuristic look to it. I would have loved to have been able to explore the city a bit more if I’m being totally honest though as the levels are fairly linear. Darren Korb and Ashley Barrett return to handle soundtrack duties and I’ve been enjoying this soundtrack so much more than Bastion. For the record, I loved Bastion’s soundtrack so that should tell you something right there. Transistor is heavily intertwined with music which makes sense considering that the main character is a lounge singer. Featuring a more rock/electronic style sound than Bastion’s trip-hop western, you’ll find wonderful musical details placed carefully in the world from combat encounters to your personal beach side cabana that you can visit at certain times in the campaign. I really didn’t have any doubts about Transistor going into it. As someone who absolutely loved Bastion, you could say I put 100% faith in Supergiant and so far, they’ve reward me with another stellar title. While I’m about halfway through my adventure, I’m not worried in the slightest that this thing falls apart. In fact, I can already feel this urge to jump right back in immediately after I finish. Supergiant, you’ve done it again. Transistor is a must play. This entry was posted in Opinion and tagged games, Opinion, PC, PS4. Bookmark the permalink.